REACTRON® systems are designed to customer specifications and consist normally of the following components: processing tank with POLYMIX® stirring system for macro mixing, POLYTRON® /MEGATRON® homogenizing system for downsizing and micro mixing, piping,process control and further specific equipment like vacuum pumps, heating/ cooling thermostates in accordance with the customer, the product and the process. 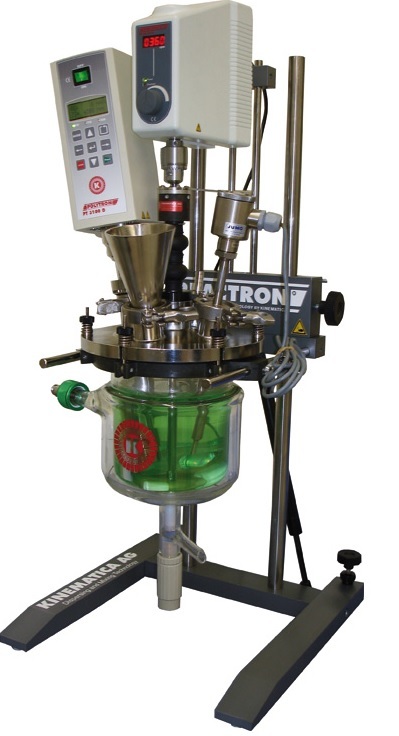 REACTRON® systems are available for batch and semi-batch operation with volumes starting from 1 liter upto several 100 litres. They can be designed and manufactured according to customer and application specifications including pressure/vacuum, CIP/SIP, clean room design and ATEX regulations. Different stirrer designs/sizes like anchor stirrer, propeller stirrer, dissolver …. and wide options on process vessels as well as pre-mixing tanks can be designed based on user requirements. The systems come with all the necessary measuring devices for temperature, pressure, level, throughput, pH, viscosity etc. Complete process control for manual, semi-automatic and automatic operation can be engineered for the REACTRON® systems. Application Examples include: production of cream& emulsions, pharmaceutical & cosmetic products, dispersing of fine solids into a liquid or molten phase, suspending of additives and solid polymers in mineral oils, production of dairy products, extraction of enzymes from biomasses,etc.